Street food with a view? The very thought can be a contradiction of sorts, but when you are in a country that has a national pastime, which happens to be eating, then it becomes more of where is it, rather than, is it for real. A short walk from the Helix bridge near Marina Bay sands, by the bay is this brilliant hawker food centre, called Glutton's Bay. 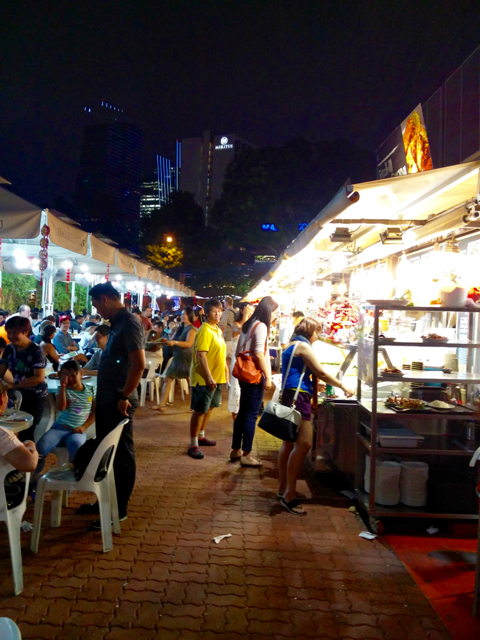 With about thirty odd stalls, this may not be the biggest hawker centre, but when we are talking of one by the bay with a view, the number of stalls doesn't mean anything. You have stalls where you wait and stalls which give you a mini gadget that vibrates when your food is ready. You have stalls serving small crabs to ones that serve humongous ones. Carrot Cake, a staple in all Singapore hawker centres that neither has carrot nor is a cake, was our first go-to dish. And I was asked if I wanted a black carrot cake or the white one. Not knowing the difference, I asked for white, mentally noting to order the black version in the next hawker centre we go to. 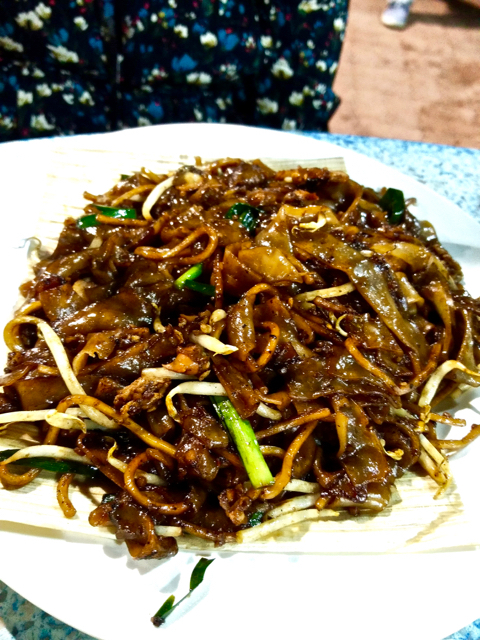 I had to have the Char Kway Teow, having read so much about it before taking off from India and of course, the Chilly Crab with the mantou buns. An order of fried rice for the kids completed the order and we waited for the dishes to pick up. The carrot cake was ready first and we weren't going to wait for the rest to arrive to start our meal. 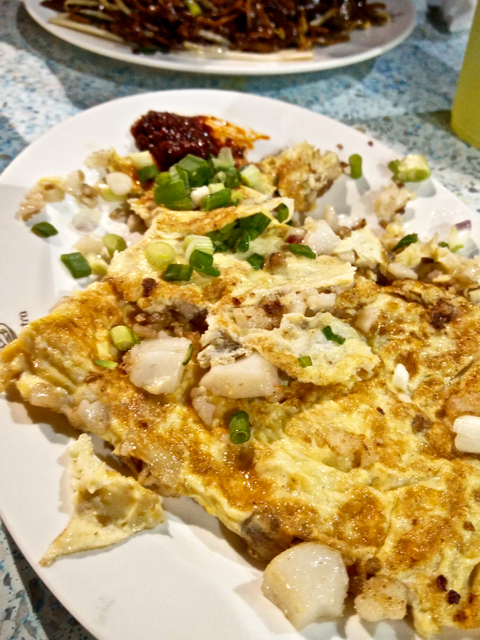 With loads of chunky radish in a rice flour cake topped with an egg, I saw why this was loved all over Singapore. It was a comfort dish almost like the muttai dosa we get in the streets of Chennai. You could taste the tinge of fish oil in the topped egg and the chunks of radish were baked so well in the rice flour that the whole thing looks like an omelette. $4 for one plate. And then the Singapore Chilly Crab. The dish I was dying to taste from the time we landed in Singapore was finally at my table. With more than five stalls serving a variety of sizes, we picked a small crab considering our appetites and paid $18 for the crab and $6 for a plate of six mantou buns. Oh yum. The sweetness of the sauce with the mantou buns were perfect for the palate as you dunk down chunks of the crab. The crab itself was soft with bits of the gravy getting to it, but with the sauce and the buns, transforms into yet another comfort type food. 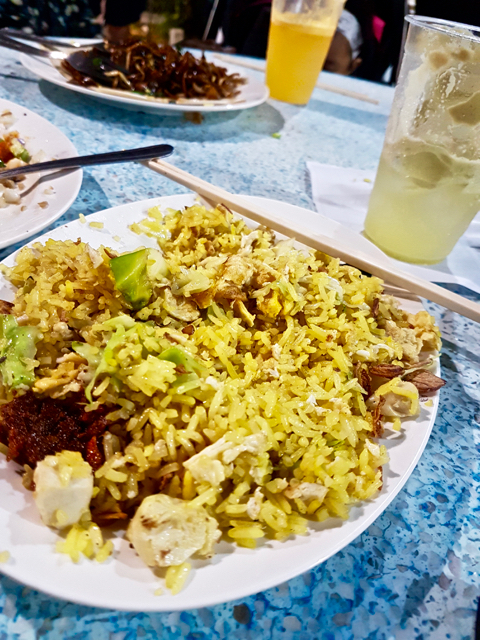 While comfort food is usually comfort only for the ones who have been having it for ages, the hawker stalls serving comfort food seem to be comfortable even for first time visitors. The view along with the breeze makes the place a lot more comfortable than it looks. 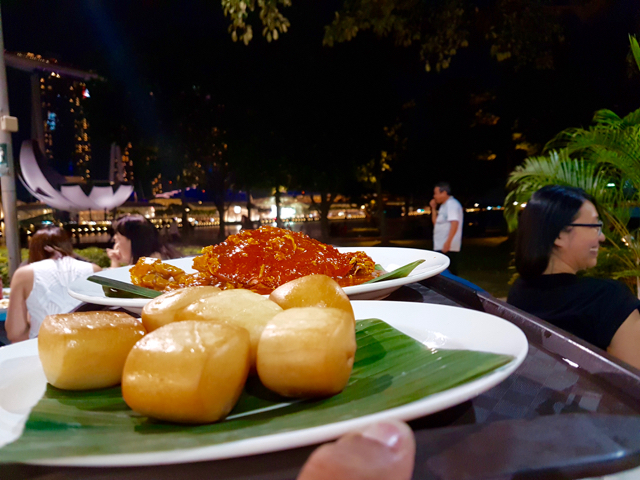 While there are many hawker centres all over Singapore, Makansutra is one that should be high on your list to visit.